🌟 #SeattleMadeWeek2018 —That's a Wrap! Wow! Our 4th Annual Seattle Made Week—a week-long celebration of the amazing products made right here in Seattle and the talented people who make them—was an absolute blast! Thank you to everyone, especially our sponsors, partners, volunteers, and staff who made it possible! 3 major public-facing events: Taste, Future, and Brewers! 22 sponsors and volunteers made it all possible! We could never pull off this week of events without the support of our community. Huge thanks to our Seattle Made Sustaining Partners who make all of our work possible: BECU, Port of Seattle, Central Co-op, City of Seattle Office of Economic Development, and Vulcan, Inc.
To our event, in-kind, and youth-tour sponsors: Central Co-op, Alliance for American Manufacturing, The Collective Seattle, The Pike Brewing Company, Redhook Brewlab, Theo Chocolate, City of Seattle Office of Economic Development, Port of Seattle, Mighty-O Donuts, Beecher's Handmade Cheese, and The Wood Technology Center. Phew! Thank you to all of our Seattle Made Members who created and served up collaborative dishes and poured samples at Taste, hosted youth tours, and shared their craft and knowledge. And last but certainly not least, thank you to our wonderful community volunteers, you are all amazing! 📸 Event Photo Galleries—Like, Tag, & Share! Seattle Made Week Partners & Sponsors: Thank You! We're excited to announce the line-up of chefs for our second annual Game of Chefs competition on July 25th! 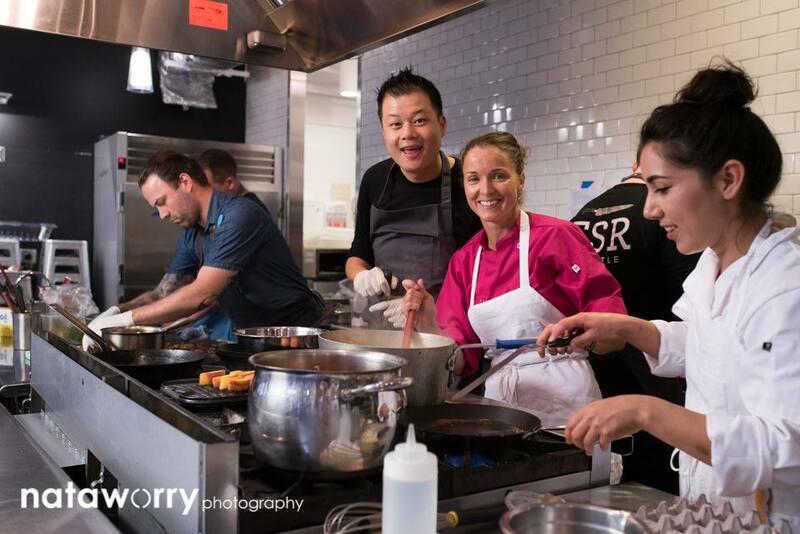 Returning champion Chef Carolyn Ferguson of Belle Epicurean will defend her title against two new challengers renowned for their passion for beautiful, soulful cuisine—Chef Varin Keokitvon ofHeartwood Provisions and Chef Wayne Johnson of FareStart! Read on to learn more about this year's chefs, The event will be emceed by the legendary Chef in the Hat, Thierry Rautureau and hosted by Tom Douglas' Hot Stove Society! TICKETS ARE LIMITED, and proceeds will benefit our programming to build a vibrant, sustainable, and inclusive local economy. This is event is pure fun, we hope you will join us! Chef Carolyn holds the distinction of being the first female American to graduate from Le Cordon Bleu Paris with the top honor in Le Grande Diplôme. After launching critically acclaimed Maison Bleu in New Orleans, Carolyn found her way back to Seattle where, in 2005, Belle Epicurean was born with the mission of bringing an authentic Parisian Patisserie experience to the Seattle market. Chef Wayne is known for his longstanding commitment to training homeless and disadvantaged individuals for jobs in the culinary field. He oversees FareStart's food philosophies, concepts, and menus across all restaurant, catering, and foodservice businesses. Previously he was Executive Chef at Ray's Boathouse, Andaluca Restaurant, and the prestigious Parc 55 Hotel in San Francisco. Chef Varin's thoughtful approach to food is demonstrated in developing menus as a collection of tastes, memories, travels, techniques, and ingredients as well as his Laotian heritage. His last tenure before Heartwood was head chef of retail operations at FareStart, where he trained homeless and disadvantaged adults while overseeing catering and restaurant accounts. Seattle Good Business Network is hosting its second annual Game of Chefs on Wednesday, July 25th. Guests are encouraged to bring their appetite for an evening filled with delectable dishes, signature cocktails and mocktails, and locally produced beer and wine. The event, sponsored by BECU and numerous local food and beverage producers, will take place from 6-9:30 p.m. at Hot Stove Society—a cooking school operated by Tom Douglas Restaurants at 2000 4th Avenue. The event features Dine Around Seattle and Seattle Restaurant Week chefs as they face off in a healthy competition to create the tastiest and most innovative dishes from a pantry of Seattle Made products and Pacific Northwest produce. Legendary chef and emcee Thierry Rautureau (thechefinthehat.com) will invite attendees to cast their votes alongside local celebrity judges to decide who will take the 2018 Game of Chefs crown! Returning champion Carolyn Ferguson of Belle Epicurean will defend her title against two new challengers reknowned for their passion for beautiful, soulful cuisine—Chef Varin Keokitvon, former FareStart chef and the creative spark behind downtown restaurant Heartwood Provisions, and current FareStart chef Wayne Johnson, known for his longstanding commitment to training homeless and disadvantaged individuals for jobs in the culinary field. As chefs create their dishes in real time, appetizers will be provided by Hot Stove Society, featuring Seattle Made ingredients from The Kitchen Imp, Firefly Kitchens, Tom Douglas' Rub with Love, Good King, Ballyhoo Hot Sauce, and more! Attendees will also have the opportunity to meet the makers and chefs and pick up some treats at the Seattle Made marketplace and silent auctions. Tickets are $125 and are available for purchase on Stranger Tickets (bit.ly/gameofchefs). All proceeds will benefit Seattle Good Business Network and its programs. Meet our Game of Chefs Contenders! We've got quite the showdown. On July 26th we’re hosting our first-ever Game of Chefs, a creative cook-off between three of Seattle’s best chefs. Our contenders will be using ingredients from a basket of Seattle Made products and a pantry of staples from Seattle’s iconic Pike Place Market. Alvin Go - Ethan Stowell Restaurant Mkt. Alvin is Chef at Mkt, but he got his professional start with a degree in chemistry and several years in a research lab before changing course at culinary school in Chicago. 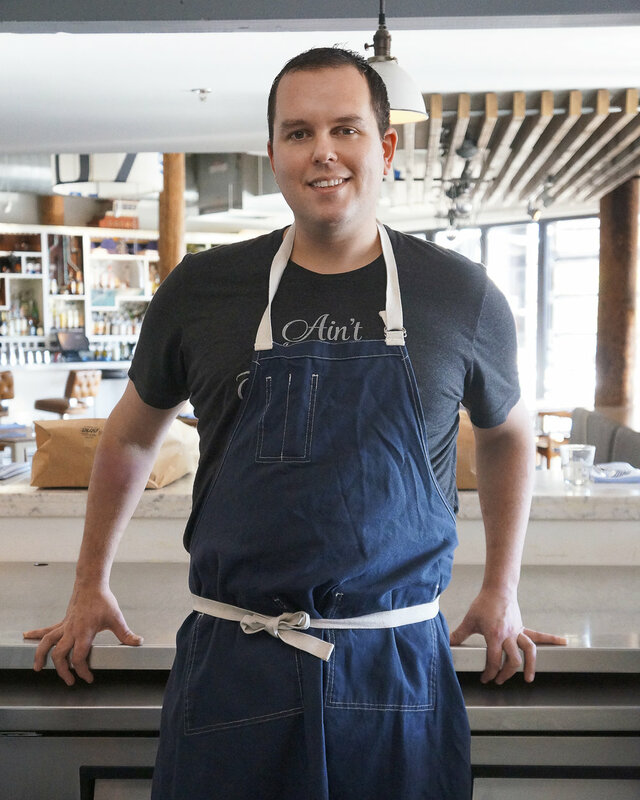 He started in one of the best kitchens in the city for four years before coming to Seattle. After working for Bon Appetit at both Seattle University and Amazon, he rose to run one of the cafes - but he missed restaurant kitchens and landed with Ethan Stowell Resturants where he is now at Mkt. Will Gordon is the Chef de Cuisine at Westward, where he’s been for the past ten months. Prior to that, he served as sous chef at How to Cook a Wolf and has also cooked at Crush and Spring Hill in Seattle, and at San Francisco’s Incanto for Chef Chris Cosentino. Will has degrees in Political Science and Spanish, and is a PNW native, growing up on San Juan Island. His basic cooking philosophy is food should be simple, but focused and thoughtful. As a native Seattlelite, Carolyn Ferguson had one dream: to bring her most beloved things together. When you slip into Belle Epicurean you get the unique opportunity to experience the magic of Paris and the joy of fantastic French cuisine, in the comfort of the rainy city we all know & love. Carolyn holds the distinction of being the first female American to graduate from Le Cordon Bleu Paris with the top honor in Le Grande Diplôme. After launching critically acclaimed Maison Bleu in New Orleans, Carolyn found her way back to Seattle where, in 2005, Belle Epicurean was born with the mission of bringing an authentic Parisian Patisserie experience to the Seattle market. We had an incredible turnout on June 6th for Fashion Evolution, our fund and awareness raiser for Seattle Sewn, our collaborative effort to strengthen local sewn-goods manufacturing. We raised nearly $7,000, but more importantly, we brought together manufacturers, designers, product developers, civic and workforce leaders, all committed to a vibrant and ethical sewn-goods economy. Abundant thanks to The Riveter for hosting, to Madres Kitchen for the delicious bites, and to all those who contributed to our shop-for-a-cause marketplace and silent auction, including FILSON, Freeman, Prairie Underground, NUBE9, Silvae, Metamorphic Gear, Satsuma, SCHAI, IMPWEARhome, and Ash + Ames. Check out the fabulous photos by Nataworry here. Interested in learning more? You can read about the initiative here and follow us here. Welcome to February's Good Buzz, a monthly digest that celebrates local economy wins, tells stories of our members and network, and shares ways to plug in and catch up on the local economy buzz. Seattle Good Business Network is a proud to be the fiscal sponsor of Fields Oceans Ranches Kitchens Stewards and invites you to join them for a full day symposium on topics important to people in the food industry in the Pacific Northwest.